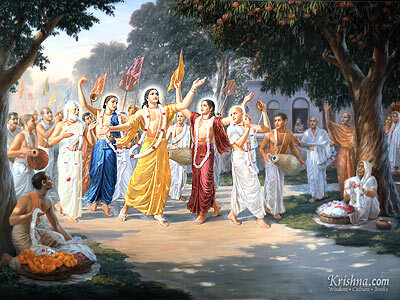 We are pleased to invite you all to Gaura Purnima Festival of 2013 ! Almost 50 fundamental books online were added to the large collection available on RKC website, which contains now 116 pieces of literature on transcendental science, in 5 different languages, already downloaded more than 28,000 times in total ! 40 videos of lectures, conversations and other movies related to the life, work and travels of H.D.G. Bhaktivedanta Swami Prabhupada, are now available on youtube channel of Radio Krishna Centrale, shared into 8 playlists for more convenient programming. Literally exploding with a huge success the RKC page on Facebook, thanks to the management of Tobia (Tusta Gaura dasa). The page is interacting with a lot of friends taking part in a number of new initiatives like quotations from Sanskrit texts, songs of devotional music, windows on spiritual world, vegetarian recipes, competitions, transcendental humor and much more! We are looking for volunteers able to translate from English to Italian and vice versa for some books, articles, web pages, video subtitles and other documents, to be published on the site. Your help will be very valuable to improve and enhance our services. The work is carried out exclusively online, no need to travel anywhere. If you are available, even part time or occasionally, please contact us. You can participate in spiritual activities (devotional service) from your own home: thank you very much ! Wish you happy festival and have fun with Radio Krishna Centrale, Hare Krishna !